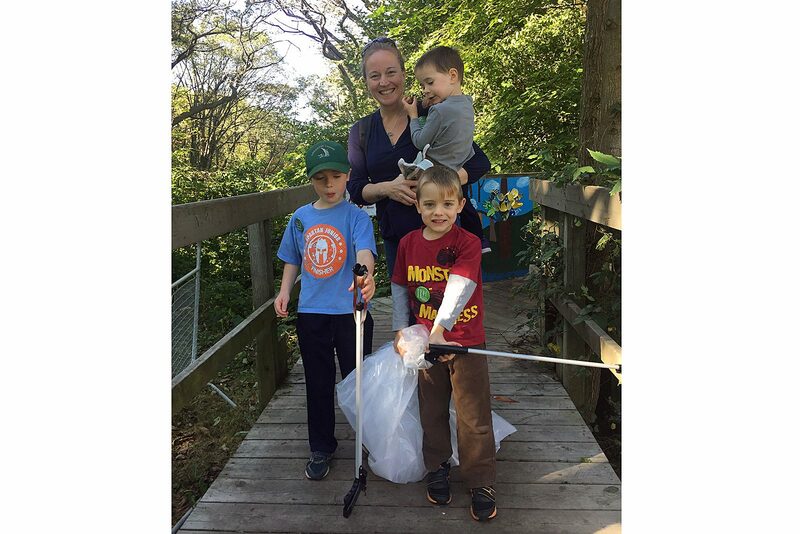 Dahnalda Bettinson with her sons Wilder, River and Archer at the Friends of Glen Stewart Ravine fall clean-up. This article marks my debut as the environmental columnist for this paper and I am excited for the opportunity. In these columns I will explore environmental issues with an emphasis on local relevance. To me, it is important to build awareness and interest in our local green projects as well as tell the stories of the dedicated volunteers who are working to make the East End a greener, healthier and more sustainable place to live. When we think of our neighbourhood parks there is often the assumption that the city is responsible for all aspects of our green spaces. But over the past 10 years there has been a marked change through increased community stewardship. In Ward 32 alone over 15 different community park groups have been transforming our green spaces. What kind of work are they doing? Cherie Daly, of “Friends of Glen Stewart Ravine” provided some examples of Friends of Parks (FoP) work: “In our ravine we have twice yearly cleanups, invasive plant removal, tree banding, nature walks and talks, meetings with residents and with park staff,“ she said. They also maintain an active Facebook site that is a great resource and attend relevant workshops and seminars. Depending on the project, they get out anywhere from eight to 30 volunteers at a time. Additional FoP projects include planting pollinator gardens, planting trees, running adopt-a-tree programs, creating community gardens and hosting farmers’ markets. How did these groups get started? In the rest of Toronto, many of the FoPs have been supported by the award-winning group Park People. However, in Ward 32, the proliferation of park groups is thanks, in part, to the inspiration and support of local councillor Mary-Margaret McMahon, who gave herself a mandate to have an FoP in every park in Ward 32 before the end of her term (Fall 2018). Ward 32 now has the largest number of FoPs in the City. In the end, thanks to many volunteers including school groups, summer camps, Girl Guides, private gardeners and more, over 40 pollinator patches were planted! In addition, volunteers grew 1,000 milkweed plants to give out, raised Monarch larvae for release and attended fairs to spread the word about butterfly habitats. Is it any wonder we experienced Monarch Mania in our area this year? The Butterfly Way was a specific project aimed at creating a network of new pollinator plantings – but East Enders have been creating a pollinator paradise in our area on an ongoing basic. Personal plantings, school yard plantings, church plantings, park plantings and guerilla (secret) plantings are helping to create a habitat corridor for wildlife. Over the last seven years, Greening Ward 32 has been involved in multiple projects, including planting and maintaining three large pollinator plantings along Kingston Road and Woodbine Avenue, an Eco Fair, the Woodbine Park Project and transportation. Greening Ward 32 will be holding meetings in the New Year to look at new projects. All of the projects that I mentioned above would not have happened without the support of a tremendous number of dedicated volunteers. I salute you volunteers and I look forward to telling your stories in future articles. If you have a project or issue you would like covered then please let me know. And remember, if you are looking for a New Year’s resolution – please say “I will volunteer” – your local community group would be delighted to have your help and it is a great way to make new friends and support your community. Katie Fullerton has lived in the Upper Beach for over 20 years. Through her work as a Live Green Toronto Community Animator she learned the importance of community support in greening up Toronto. She is a past member of East Toronto Climate Action Group and is a member of Greening Ward 32 . Katie is also a member of Toronto Urban Growers and coordinates the annual Scarborough Seedy Saturday and Green Fair. Connect with her at k_fullerton@sympatico.ca.